Togean islands still primitive islands , no signal internet and slow. ferry boat schedule to togean islands. Public boat schedule on togean islands, (Update information at 11 January 2019. NEW SCHEDULE INFO :Now,since 11 January 2019. the ferry boat working 3 time every week to Togean islands. the ferry boat name is Tuna Tomini,leave from gorontalo city harbour to togean island(wakai) every tuesday – friday – Sunday ,12 hours to cross,overnight on ferry boat. the ferry boat name TUNA TOMINI. Tuna Tomini boat leave from Gorontalo harbour every Tuesday -Friday – Sunday at 17:00 of clock in the afternoon. will be arrive in togean islands (wakai) at 07:00 of clock on next day. NOTE : Every first month on sunday, the ferry boat TUNA TOMINI not working to leave to togean island. Return ferry boat Tuna Tomini . from wakai (Togean islands) to Gorontalo city is every Monday – Thursday- Saturday, leave from wakai-togean at 16: 00 of clock afternoon, arrive in gorontalo at 06:00 morning. NOTE : Every first month, on saturday,the TUNA TOMINI ferry boat not working to Gorontalo. PRIVATE CABIN ROOM on Ferry boat. If you want to conforttable and good sleep in Tuna tomini ferry boat,you can take the Private Cabin Room, because on business& economy class is very buzy with many pasenggers. just 8 cabin room on this ferry boat, the crew of cabin give rent this Cabin room, the Cabin not public sale,just the economy and business class is public sale on. 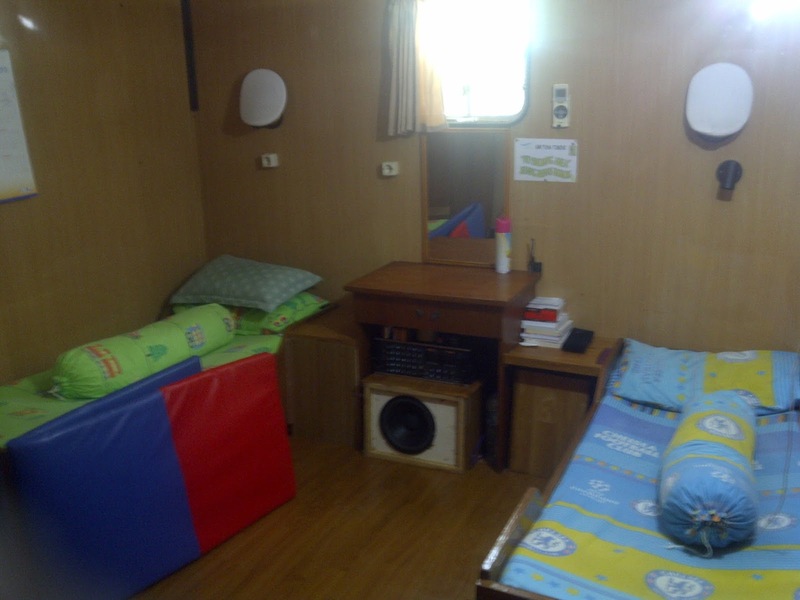 On Private cabin have the Bed for sleep,air condition room and not noize and savety the lugage/bagage,pocket,handphone. The Cabin room have 4 bed and 2 bed, if you family or couple you can choice the cabin room for confortable sleep and savety lugagage/bagage. The Cabin room price IDR 600.000 Rupiah/cabin/one way, the price not include ticket entrance,ticket entrance is 65.000 Ripiah/ticket. On July,August& December is high season,many tourist holiday,Please booking before ,because limited the cabin. The ferry boat cabin room. For Booking The Cabin, please Contact WhatssApp or Telephone: +62 822 5968 6668 , or you can come to the Office Operator of Tuna Tomini Cabin. Address : jalan Anton Sujarwo, kelurahan Tenda puncur, Belakang kantor Lantas Kota Gorontalo, (KEDAI REMPAH). WhatssApp or Telephone : +62 822 5968 6668. You can come from the airport to the operator of Cabin office, have free transit room and Spice Coffee shop and spice Tea, free Wifi area, near harbour, just 15 minute. you can transit here, shower, relax for waiting ferry harbour open , because the ferry harbour open at 14:00 of clock. you can also booking Economy class Ticket of Tuna Tomini ferry boat on this office. And ask all update info about Togean islands. From paguat marisa (Regency of Gorontalo Province) to togean islands. Ferry boat from Paguat-marisa to Togean islands (Dolong-waleakodi). Crossway just 5 hours. The ferry boat name Cengke Afo,the boat size like Tuna tomini. Ferry boat from paguat-marisa leave every thursday and sunday at 07:00 in the morning, cross way just 5 hours. Ferry boat will be arrive in dolong harbour on waleakodi island-togean, from waleakodi island many connect small boat to malenge island,katupat or kadidiri. From gorontalo city or airport you can go to paguat-marisa,long road 2,5 hours by private car / charter. For private car you can booking the private car on telephone or whatsapp number : +62 895707277007. The price car is 700.000 rupiah/car, 7 seat (toyota innova/avanza). 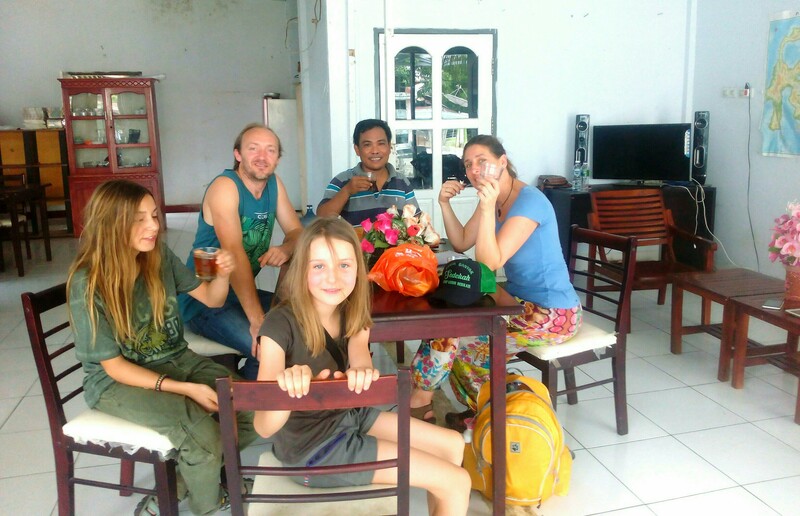 In Paguat-marisa you can stay overnight in homestay in paguat, the homestay close the harbour, just 15 minute to harbour by tok tok-motorbile or car, the room homestay price 100.000 rupiah – 150.000 rupiah/room. There is also waiting room in harbour of paguat-marisa, sometime the local people sleep there for wait the ferry boat. Ferry boat cengke afo back to paguat marisa from dolong-togean islands every wednesday & saturday, leave from dolong harbour (togean islands) at 07:00 in the morning and will be arrive in paguat-marisa at 12:00 of clock (5 hours).